CNC, Cutting mortises and routing deep blind holes. CNC, Grooves and dadoes in single sided veneers and laminates. 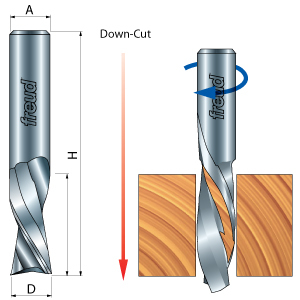 Freud’s solid carbide down spiral bits are ideal for smooth, chip-free routing where chip removal is not a problem. Cuts all composition materials, plywood's, hard, and softwoods. Use for grooving or edge work. Ideal for Wood, Wood Composites, Plastics (Hard & Soft), and Aluminum for 2D and 3D Carving. 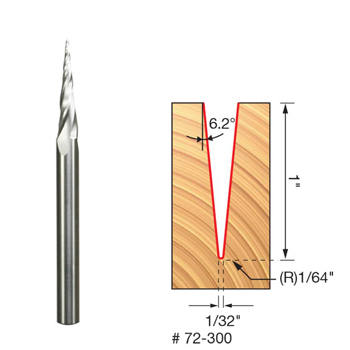 1/2" & 1-1/8" Up Cut Spiral Ball Nose Solid Carbide Bit. Includes 2 flutes and 1/4" diameter. 1/4" Shank. 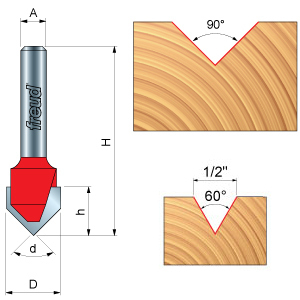 Freud Solid Carbide Ball Nose Bits are ideal for routing plastics, composites, wood or solid surface materials. Use for grooving or edge work. Ideal for Wood, Wood Composites, Plastics (Hard & Soft), and Aluminum for 2D and 3D Carving. Perfect for engraving and lettering applications in hard or soft wood, or composite materials. Ideal for Wood, Wood Composites, Plastics (Hard & Soft), and Aluminum for 2D and 3D Carving. 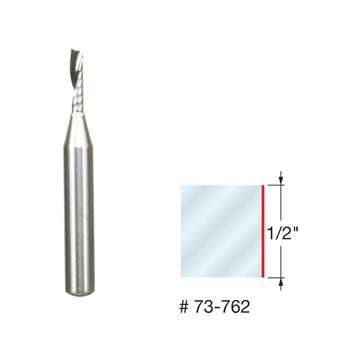 7.5° x 3/16" Engraving V-Groove Solid Carbide Bit. 1/2" Cutting Length. 1/4" Shank. Perfect for engraving and lettering applications in hard or soft wood, or composite materials. Ideal for Wood, Wood Composites, Plastics (Hard & Soft), and Aluminum for 2D and 3D Carving. A great choice for 2D or 3D carving work in plastics or wood. Ideal for Wood, Wood Composites, Plastics (Hard & Soft), and Aluminum for 2D and 3D Carving. 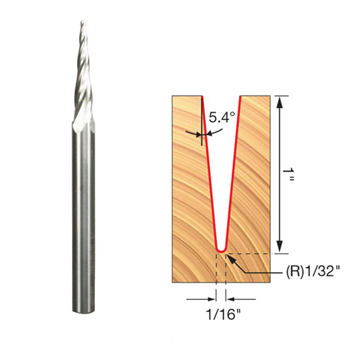 5.4ºx 1/16" Tapered Ball Tip Solid Carbide Bit. Includes 4 flutes and 1/16" diameter. 1/4" Shank. A great choice for 2D or 3D carving work in plastics or wood. Three-flute design lets you make fast cuts with very efficien chip and dust evacuation.Ideal for Wood, Wood Composites, Plastics (Hard & Soft), and Aluminum for 2D and 3D Carving. 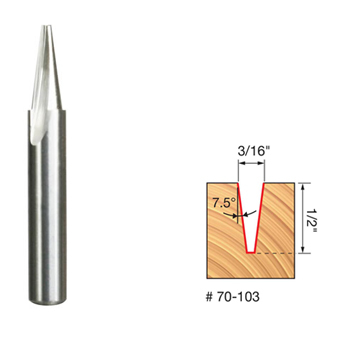 6.2° x 1/32" Tapered Ball Tip Solid Carbide Bit. Includes 3 flutes and 1/32" diameter. 1/4" Shank. This solid carbide carving bit features an extremely fine 1/32" diameter tip for ultra-detailed cuts. 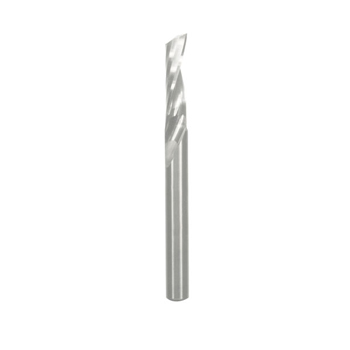 The 3 flute design provides fast chip clearance in deep cuts.Ideal for Wood, Wood Composites, Plastics (Hard & Soft), and Aluminum for 2D and 3D Carving. 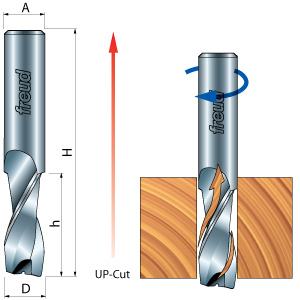 Ideal for making signs and adding decorative accents to furniture & plaques, Freud’s “V” grooving bits are designed to cut deep or shallow “V” grooves. Cuts all composition materials, plywood's, hardwoods, & softwoods. Use on CNC and other automatic routers as well as hand-held & table-mounted portable routers. Ideal for CNC, mortising & dadoes. 1/2" Spoilboard Surfacing & Rabbeting Bit Insert Cutter. 1-1/2" diameter. 1/2" Shank. 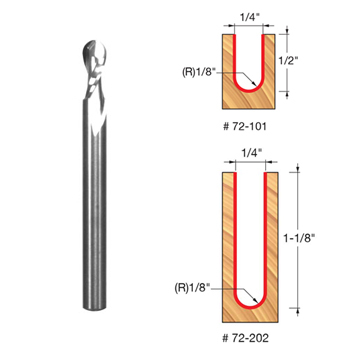 The ideal bit to keep your spoilboard perfectly flat for the utmost accuracy in your projects, this bit is also great for routing precise rabbets. 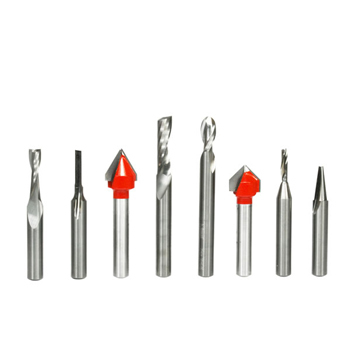 The replaceable solid carbide inserts can be rotated so all 4 edges are used, providing extremely long life, even in abrasive materials. Ideal for CNC, mortising & dadoes. To make very clean, precise cuts in a wide variety of plastics: acrylic, polycarbonate, HDPE and more. O-Flute design delivers cooler cuts in plastic to avoid melting. Upcut spiral clears chips fast and provides perfect bottom surface. 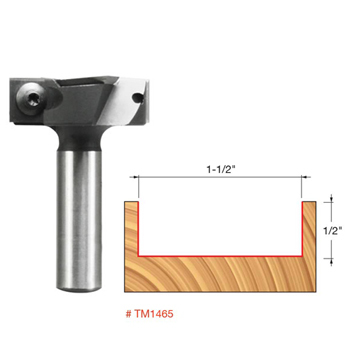 Designed for small and large CNC machines for graphics, sign making, intricate detail work, and cutting out material where a smooth finish is required on the finished edge. Freud's solid carbide O-flutes are "mirror" polished, reducing heat to give the ultimate in life with less welding or recutting of chips. Provides a clean ultra smooth, ready to use finished edge. Ecellent for detail work in all composite, plastic, hard and soft materials. For use on "table top"/ portable CNC, mid size and large CNC machines and hand held routers. 8 piece Sign Making CNC Router Bit Set, 1/4" Shank. Ideal for Signmaking, Lettering and Engraving in a variety of materials. 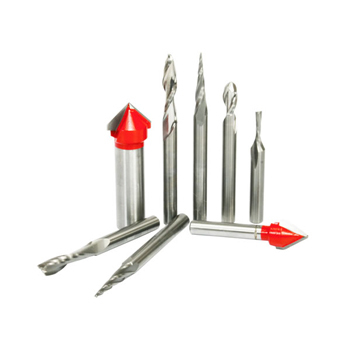 8 piece General Purpose CNC Router Bit Set, 1/4 Inch Shank specifically designed for a wide variety of applications.